“At the moment we are experiencing a huge brain drain from Albania, especially young people with an IT background. As soon as they finish their studies, they immediately leave Albania as there’s a huge demand from countries such as Germany, where there are higher living standards and salaries.” – Linda Shomo, CEO & Founder of EasyPay. Ludovic Laventure has made his own way to Albania. The French businessman, born in 1967, is now managing director of the Albanian Fintech Mpay, which specializes in smartphone-based bank transfers. The conditions are excellent: Albania has a 100% coverage rate for mobile phones and a huge demand for low-threshold payment services: Laventure’s smartphone app is something of a technical intermediary between the bank and its customers. One of Mpay’s partner banks is the Albanian subsidiary of the Austrian Raiffeisen Bank International. Laventure’s founding career began with the French appetite for frogs‘ legs. In the mid-1990s, this identity-creating specialty threatened to become rare in the French gourmet cuisine. The then 29-year-old businessman Laventure sensed an opportunities. A friend had previously drawn his attention to the import-export opportunities in Albania: „I was attracted by the atypical proposition of collecting frogs in Albania to export them to France“, Laventure explains his first Albania investment. Laventure, however, was not deterred. In 2000, the Lyon-born man finally packed his bags and moved to Tirana. In addition to a strong real estate commitment during the 2000s, there was enough time to explore business opportunities in the telecom and provider business. Foundations of several IT start-ups in the Telco and media sector followed. The Frenchman observed that the gap between banking services and customers can be bridged more and more easily with the possibilities of a smartphone app – ideal for the Albanian market with weak infrastructure. 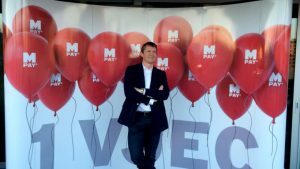 Founded in 2013, Mpay is one of the most successful payment services providers in Albania and Kosovo with more than 75,000 customers and 250,000 monthly transfers. Albania expects a GDP growth rate of 3.6 to 3.9 percent this year. The fluctuation comes from uncertainty about the impact of the construction of the Trans Adriatic Pipline TAP, which will bring gas from Azerbaijan to Western Europe. Investment in Albania’s section is expected to amount to about €1.5 billion over six years, and up to €450 million in 2017 alone. The results make sense: The Institute of Statistics (INSTAT) confirmed in the second week of June that the unemployment rate during the first quarter of 2018 dropped to 12.5 percent, the lowest in 30 years. The Albanian economy is on the way to catching up with neighboring countries. With a GDP per capita and year of 9,873 dollars (compare: Austria 2018: 39,506 dollars, source: WKO statistics), however, the march is still laborious. For founders, the situation remains challenging „The startup community has its struggles to get off the ground. It is still very early stage,“ writes start-up blogger Kathleen Fritzsche, who spent several months in Tirana as an entrepreneur-in-residence in 2017. There are a few companies which have reached international recognition and success like Softmogul and Dentem, but – as so many – both Albanian companies migrated to the US during last years. Slowly, trends like food blogging and tourism start-ups are picking up some momentum and get some well-deserved recognition from the public. „I see a lot of potential in that area to create the first wave of successful start-ups“, so the German journalist. “The digital start start-up community in Tirana is growing every day, there are many young people with brilliant ideas who are trying hard to translate their ideas into a business model”, says Linda Shomo, CEO & Founder of EasyPay, is in the interview with trendingtopics. The IT specialist founded EasyPay in 2010, which, like MPay, is active in electronic payment transactions and now represents Albania’s largest provider of a digital payment platform. Linda Shomo currently employs a team of 30 people. However, her most pressing problem at the moment is not the market: she struggles daily with the excesses of emigration of the best minds:“At the moment we are experiencing a huge brain drain, especially young people with an IT background. As soon as they finish their studies, they immediately leave Albania as there’s a huge demand from countries such as Germany, where there are higher living standards and salaries.” In addition, the country lacks a significant number of business angels and early-stage investors interested in funding (tech) startups. Traditional businesses still seem to be more attractive to investors. But there are also exceptions to the rule: The fan article shop AlbanFootball was founded by two Albanians who found their way from New York City to Tirana. Home comer and founder Alban Selami and his partner Eklid Meço describe the everyday hurdles of Albanian business life: „Incorporating a big business – we are considered such in Albania- can be challenging task. Public funding programs for start-ups are pretty much unknown in Albania. The start-up center Oficina is the best known example for a working accelerator program in Albania. EasyPay-founder Linda Shomo complains, that „there are only a few founding-centres in Tirana. However, they should be implemented in other cities of Albania as well, otherwise the digital and economic gap between the capital and the rest of Albania will continue to deepen.” Most of the start-up assistance and support in Albania comes from independent international organizations and the private sector. Being a small market, Albania has not yet been explored by the Fintech community from more developed markets. In this regards banks could foster innovation and boost demand in this area by taking a driving seat that can prove to be of mutual benefit. Activities such as Raiffeisen Bank International’s Elevator Lab can further boost fintech innovation and the local fintech ecosystem and work towards a win-win situation. Trending Topics is the fastest growing innovation portal in Austria. We report comprehensively, quickly and qualitatively on start-ups, mobility, blockchain and all other topics that are important for the innovation landscape.